Few weeks ago Bethany of Dirty Kitchen Secrets launched a recipe contest on the new Linwoods’ product: Flaxseeds, Cocoa and Mixed Berries sprinkle. I have come to know Linwoods’ products since last year Food Bloggers Connect conference. In our goodie bags we found few nice pouches of their healthy products featuring flaxseeds, goji berries, hemp, sesame and other yummy and nutritious seeds to sprinkle almost on anything that comes to your mind. For instance, lately I always add them to my healthy sweet fix of the day: sweetened quark cream with nuts, honey and sometimes also herbs or berries depending on what I have in the fridge. Seared salmon with Linwoods’ seeds, berry and cocoa mix served with a soy-chocolate dip, blanched fava beans, chervil and ginger. Heat well a non-stick skillet on medium-high heat. Pat the salmon fillets dry using paper towels and when the pan will be ready, place them in it searing the first side. Wait 2-3 minutes before turning them, by now the first side should show a lovely orangey crust with dark grill-like marks; if this is not the case do not turn the fillets yet. When also the second side will be seared, it will take another 2-3 minutes, place the fillets on a plate and let them rest covered with some aluminum paper. To prepare the sauce, in a tiny sauce pan combine the soy sauces with the water, rice wine and chocolate. Delicately warm the sauce to let the chocolate melt whisking to incorporate it. You can always place the saucepan in another bowl containing hot water; since chocolate melts below body temperature so you won’t need really boiling water. If needed, you can now season the sauce furthermore with some light soy sauce. While the sauce is cooling down, take away the tough skin from the fava beans by pinching it open and squeezing the seed out, we don’t need mash for this recipe so be gentle. Slice now the salmon fillets along the short axis in bite sized pieces and coat one side of half of them with the Linwoods’ seeds and berries mix. Plate the salmon bites with the side of fava beans. 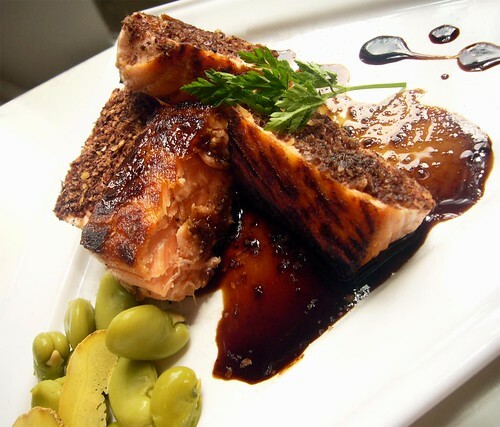 Drizzle the salmon and the dish with a little of the sauce (not the beans). Place the ginger slices and the chervil branch in a decorative manner and serve with the remaining sauce in a dipping dish and some more Linwoods’ cocoa seeds and berries mix as sprinkle. very interesting use of the flax seed mixture. 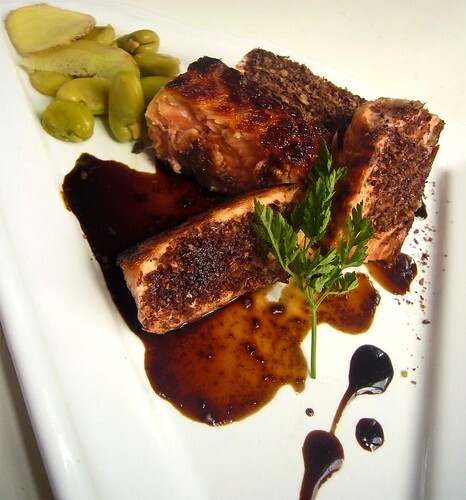 Love the chocolate sauce w salmon. Love your above dish. I would have never thought of it to use it that way. :) I so wanted to do a recipe for this but I don't have the time. I barely managed to get our luggages together on the morning we flew off. :( Debated about bring the bag of linwood's seeds with me to S'pore but in the end, I decided to against it as I'm arriving on the last day evening of June so won't be able to bake anything with it anyway. WOW! very innovative way to use the flax seed mixture! Love it!! Oh my! Alessio, you are one of the most creative chefs I know. I so want to eat at your house! This is fabulous and intruguing! Gorgeous!